Is Every Love Visited by a Muse? I’ve often wondered about the function of the muse—as ” Inspirer”— in all relationships, little known or famous. My sense is that at the very moment when love dawns between two persons, the Inspirer appears. Many experience the passion of intimacy as a beginning stage of “infatuation”. When two are “in love,” songs and poetry are often shared and even written for one another. The world appears transfigured. Both walk through the world with a bounce in their step and report that even colors are more vivid and little bothers them. They appear confident in their love and the entranced couple believe they could endure any trial with grace. But then, something happens. Their love loses its original power, fades, and what was initially a blazing fire, becomes a heap of dying embers, only to turn into ash. Perhaps it just that the muse is fickle, or needs to be attended to, even given an altar or some elevated space with flower or stone or cup. Although many loves naturally end and should because their purpose has been fulfilled, are there some loves who simply neglected to nurture or listen to the quiet song of the muse? 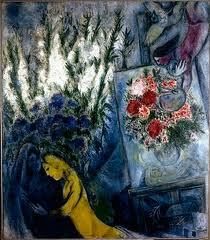 Not Marc Chagall. Even in death his beloved Bella continued to be his “Inspirer.” There is a painting that is not as well known as many of his others. It is called “Anniversary Flowers.” It depicts the artist before his easel on each anniversary of his wife’s death. He comes to the canvas for an astral meeting with his beloved. In the painting Marc is turned away in reverie with his hand outstretched to Bella. Just above the canvas of red and gold blossoms the spirit of his beloved has come to greet him. My God, what a love this must have been, even after Bella’s physical death. Below is a summary of an account that recently appeared in The Telegraph, reporting the finding of a notebook Chagall kept for twenty years after the untimely death of his wife and beloved. There are images by Chagall that are contained within the pages of a notebook that once belonged to Bella, whose sudden death at the age of 49 devastated the artist.After his wife died in 1944 from a viral infection, the grieving Chagall kept her notebook, which he illustrated for the next 20 years, sketching on the blank pages and surrounding Bella’s writings with colourful and moving posthumous portraits of her and the two of them together. In one sketch, Bella is depicted in a patterned dress with a bowl of fruit, while another drawing shows her with dark circles around her eyes, possibly depicting her final illness. The couple also appear together throughout the notebook, with Chagall recalling their wedding day in 1919 in a pen-and-ink drawing of them as bride and groom. In perhaps the most moving image, Chagall, with a blue face and melancholy expression, is seated at his easel, contemplating a red painting of himself and Bella, one hand reaching out to touch the canvas with his other hand held to his heart. Another etching captures the artist’s vivid imagination, featuring a walking double bass with a flowing mane of hair in the shape of a violin, and a collection of mermaids. Until her death, Bella appeared in some of his most famous works, including “Bella with White Collar,” 1917. Though Chagall remarried in 1952, his second wife, Valentina Brodsky, rarely appeared in his work, and Bella continued to act as his “Inspirer”—his lifelong muse. I am familiar with the first part of Denis De Rougemont’s thesis: that the songs of the troubadours in the 13th century are remarkable, in that they exemplify one of the first movements away from pre-arranged marriage between families and toward individualized love between two persons. However, as to the second part of your reading, let me say this. As one proceeds up the spectrum of consciousness, there is less divisiveness and rejection, and more integration and inclusion. So follows the ladder of love even as one might also follow the tenets or principles of any religion. As far as I am aware, the historical Christian notion of love adheres to the Deuteronomic indictive: Love God, love others and love self. This can be taken in dualistic terms or in non-dualistic terms, depending upon one’s level of awareness. Be that as it may, I do not see how any religion’s principles of love could do anything but have inspired any authentic troubadour’s heart,regardless of whether they were conscious of it or not.